Desperate for a Hard Water Stain Remover that Works? Prevent & Remove Rust Stains Like a Pro! 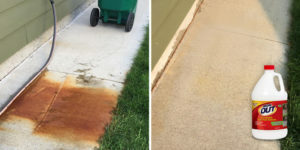 If you’re a homeowner with hard water, well water or water with high iron content, few things are worse than rust stains in your sink, bath tub and toilet, or on your sidewalk, driveway and siding. Although harmless, rust stains are unsightly and embarrassing, and, if you have well water, they probably won’t go away. Rust stains are the result of dissolved iron in your household water. It oxidizes and causes stubborn, reddish stains that can be a nightmare to remove. There’s no need to despair, though. Some simple measures – and proven products – can act as amazing hard water stain removers to keep rust stains at bay and your home looking sparkling clean. As with anything, the best recourse for rust stains is prevention. Simple acts like wiping down the bathtub and sinks after use will help prevent the accumulation of rust stains. Avoid using household cleaners that contain bleach, since bleach chemically reacts with iron in the water and makes rust stains worse. Installing a water softener can make a difference as well. A water softener is designed to dissolve calcium, iron, magnesium and other minerals from hard water; be sure to select a water softener salt that is specifically formulated to remove iron from the water. Home remedies using vinegar, lemon juice, oxalic acid and pumice stones have proven effective in removing rust stains, but they require a lot of effort, time and vigorous scrubbing. Among the most effective commercially available products for combatting rust stains is the Iron OUT family of products – each of which serves as a highly effective hard water stain remover on many surfaces. Iron OUT Rust Stain Remover Powder is perfect for use in removing and preventing rust stains in bathrooms, kitchens, appliances, laundry, water softeners and many more applications in and around the home. Iron OUT Rust Stain Remover Spray is specifically formulated to cling as it dissolves rust stains on contact. It is perfect for vertical and hard-to-reach places like showers, toilets above the water line, colorfast carpet, metal parts and equipment, and more! 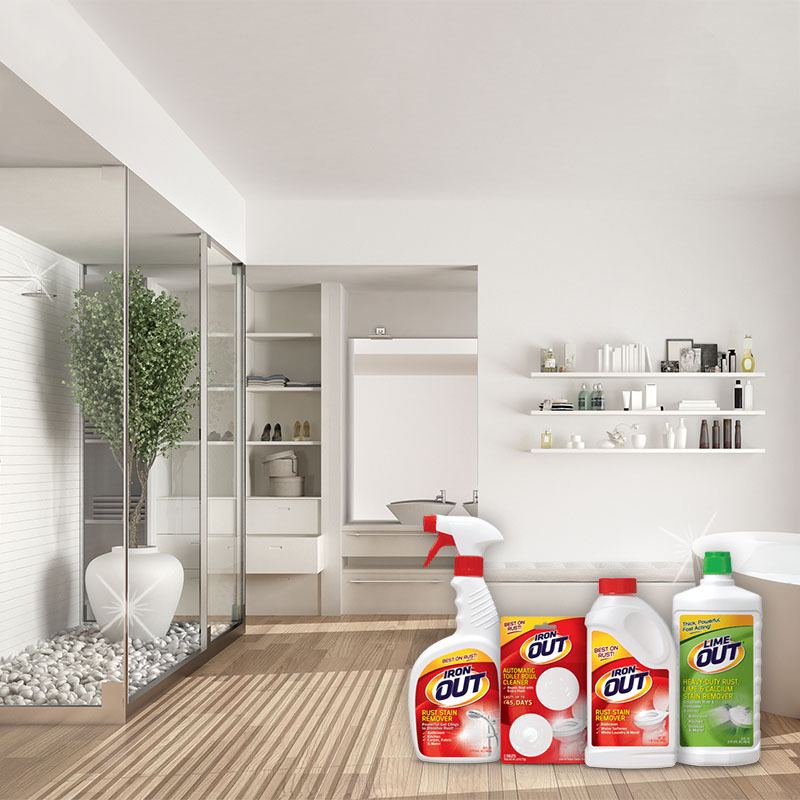 Iron OUT Automatic Toilet Bowl Cleaner is a concentrated, long-lasting tablet that repels rust and hard water stains with every flush of the toilet. Iron OUT Outdoor Rust Stain Remover is a ready-to-use liquid formula that quickly removes rust stains from concrete, vinyl and other surfaces outside the home, without scrubbing. It’s ideal for use on vinyl siding or exterior walls, concrete sidewalks, driveways, fences, outdoor equipment and many other outdoor surfaces, yet is safe to use near vegetation. Even with hard, iron-rich water, it’s easy to remove rust stains and keep your home sparkling clean with Iron OUT products!